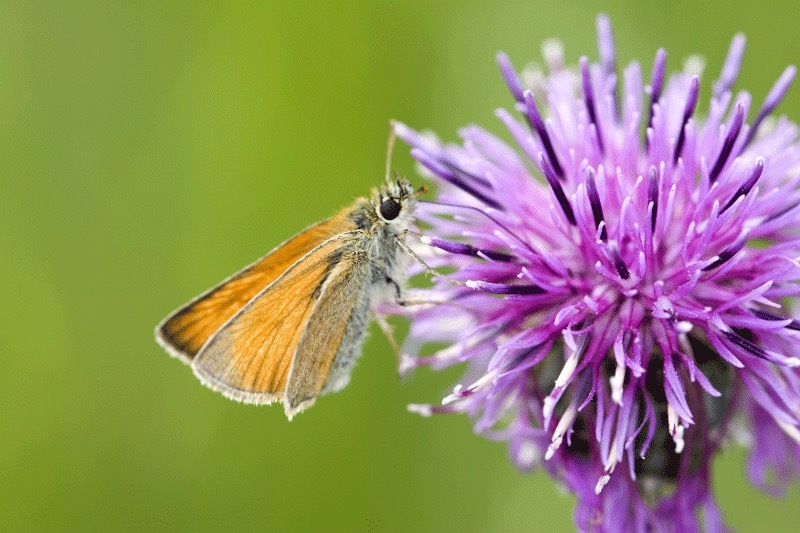 Almost identical to the Essex Skipper, the Small Skipper has dull brown/orange tips to the antennae, while the Essex Skipper has distinctive glossy black tips to its antennae. Small Skippers are also slightly more orange in appearance. Like other skippers they spend much of their time basking on grass stems. The single flight period is normally from early June until mid/late August, peaking in July. Yorkshire-fog (Holcus lanatus) is the main food plant,but the following grasses have also been recorded. Unimproved, uncut grasslands in open sunny locations. Roadside verges and disused railways lines are also frequented where the larval food plant is abundant and grows tall. Resident, common/frequent and widespread, currently declining in abundance. Earliest county record 29 May 2008 Breach Hill, ATE SP(W) (Tim P Mann).